Though public understanding of the need for climate-friendly policies is critical, many Americans remain ill-informed about the facts and risks of global warming. For good reason. Too often, scientists’ explanations of climate change are unnecessarily burdened by confusing caveats and boring or complicated jargon. Some messengers are politically divisive figures who put some people off simply because of their partisan associations. At the same time, a well organized and well-funded anti-climate-action lobby has effectively sown confusion and doubt about the issue with the public. The results can be discouraging. While most Americans understand global warming is real (66%, according to our most recent national poll, conducted with colleagues at George Mason University), fewer than half knows it is caused mostly by human activities (43%). More than half of Americans say they are “worried” about climate change (56%), but few (11%) are “very worried” about this urgent threat. And though a majority of Americans say global warming should be a priority for President Obama and Congress, compared to issues such as the economy, health care, and jobs, addressing climate change usually ranks at or near the very bottom of the list. These numbers have hardly budged over the past few years, despite increasing publicity about the perils of global warming. But there are signs of change when you look at what different groups of voters think. Solid majorities of Americans support a number of climate-friendly policies, including funding more research into renewable energy sources such as solar and wind power (77%), regulating carbon dioxide as a pollutant (75%), and setting carbon dioxide emission limits on existing coal-fired power plants (67%), among others. And organizations like ours, the Yale Project on Climate Change Communication, are working hard to better understand how people think and feel about global warming – across political, socioeconomic, ethnic, and generational lines – so we can help communicators more effectively reach very different kinds of audiences. But even if communication efforts fall short, there’s another cause for hope. 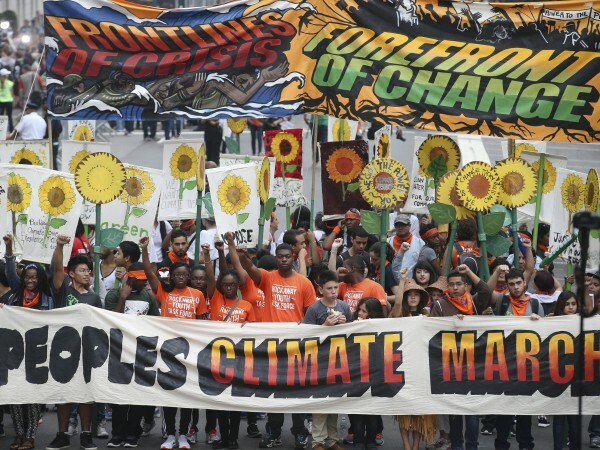 The American electorate is evolving in ways that allow us to forecast increasing support for climate-friendly policies and, indeed, growing demands for action from our elected officials. I’m referring here to the Rising American Electorate (RAE), a voting block identified by the non-profit Voter Participation Center as young voters (18-30 year olds), Latinos, African-Americans, unmarried women and others. According to exit polls, this group accounted for about half of voters (48%) in the 2012 national elections and is projected to comprise a growing proportion of the electorate in the coming years. The RAE is more engaged than other Americans on climate issues. 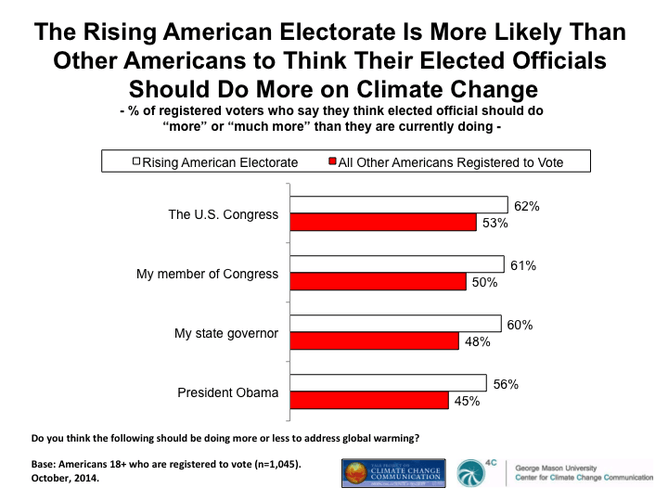 According to the Yale/George Mason research, a solid majority of the RAE is worried about global warming (63%), compared to just half of other Americans registered to vote (50%), and more of the RAE say global warming is important to them (62% versus 52%, respectively). More important, the RAE is keen to see action. 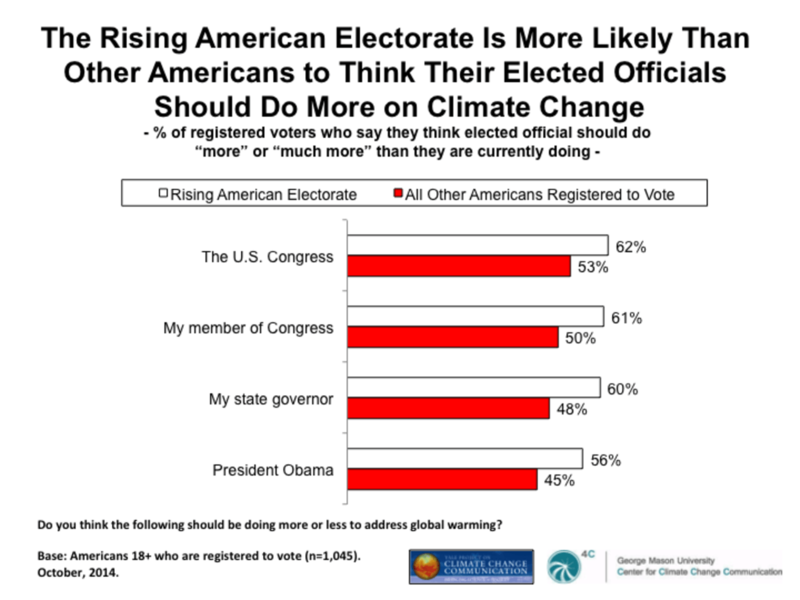 About half say climate change should be a very high or high priority for President Obama and Congress (53%), compared to just four in 10 other Americans registered to vote (39%). Larger blocks of the RAE want their elected officials to do more to combat global warming – Congress (62% versus 53% of other registered Americans), their own member of Congress (61% versus 50%), their governor (60% versus 48%, respectively), and President Obama (56% versus 45%). Moreover, larger proportions of RAE voters have taken personal action, such as signing a petition (21%), donating money to an organization devoted to fighting global warming (18%), or volunteering money (14%) or time (11%) to a candidate who favors climate action. So there is reason for optimism about action on climate change – public opinion is moving in the right direction – though much work still needs to be done. For the time being, majorities Americans already support certain climate-friendly policies, and a growing block of voters – the Rising American Electorate – expects our elected officials to take action to protect our planet and our future. How the poll was conducted: Findings cited above come from a nationally representative survey conducted by the Yale Project on Climate Change Communication and the George Mason University Center for Climate Change Communication Interview dates: October 17-28, 2014. Interviews: 1,275 Adults (18+). Average margin of error of the total sample: +/- 3 percentage points at the 95% confidence level. The research was funded by the 11th Hour Project, the Energy Foundation, the Grantham Foundation, and the V.K. Rasmussen Foundation.